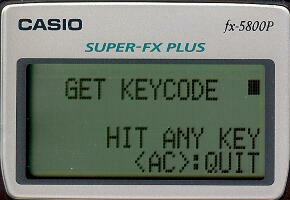 fx-5800P Basic has Getkey command same as the other graphing calculators. This command makes programming very flexible. fx-5800P does not have I/O feature to communicate with PC, just excepting source code copy just between fx-5800Ps. 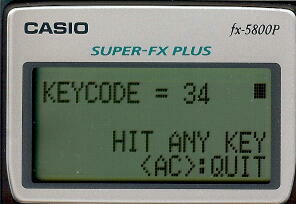 Try this short program which tells you keycode of the key you pressed. ... when press EXE, you'll see the Keycode is 34. Every key has unique 2 digit keycode, but you can get single digit keycode, 1 to 7. I found this when play around with the program. I think this program code should run on fx-cg10 and fx-9860Gxx, but I did not try this yet (I don't have any of these). Try pressing more than 2 keys at the same time, if you find the condition to get single digit keucode, this may be used for a secret key for your game. I'm not sure this is well known or not, but let me introduce this "secret of keycode"
I will post the condition to get single digit keycode later. Edited by Krtyski, 18 January 2014 - 01:35 PM. This is interesting, I'll have to try it on my PRIZM when I get a chance. How to write output and wait comand (triangle mark)??? How to describe "Not equal", "equal or greater"??? When I use code tags, is there any benefit for other member? Edited by Krtyski, 20 December 2013 - 06:21 AM. I replaced the source code. I did this with my fx-5800P, now I'm interested in result with the other calcs. Edited by Krtyski, 22 December 2013 - 04:29 AM. I'm very interested whether a type of people coming here have already known such tips.